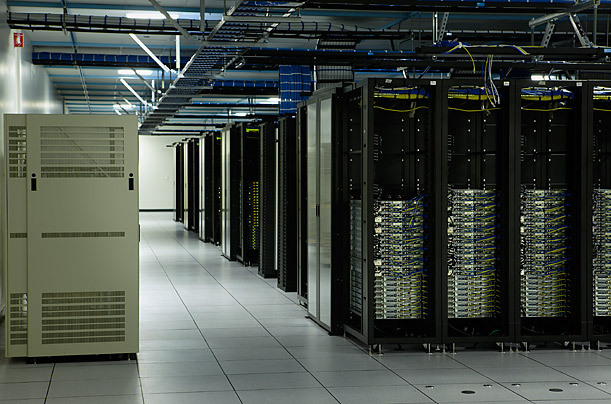 Pic from the Facebook Data Center. Jeff Rothschild, the vice president of technology at Facebook said “Today we have somewhere in the neighborhood of 70,000 servers,” during the Q&A session following his talk, adding that the number ”will be different today than it was yesterday” because Facebook is adding capacity on a daily basis. That places Facebook among the largest Internet companies that have publicly discussed their server counts, but still well behind hosting providers Rackspace, 1&1 Internet and OVH, which each house more than 50,000 servers in their data centers. It also suggests that Facebook has added about 20,000 servers since early 2008, which explains why it borrowed $100 million in May 2008 to fund server purchases. Rothschild also shared some huge numbers associated with Facebook’s photo storage operation, which now stores 80 billion images (20 billion images, each in four sizes). Rothschild said the real challenge isn’t storage, but delivery. ”We serve up 600,000 photos a second,” he said. The amount of log data amassed in Facebook’s operations is staggering. Rothschild said Facebook manages more than 25 terabytes of data per day in logging data, which he said was the equivalent of about 1,000 times the volume of mail delivered daily by the U.S. Postal Service.